A Professor of medicine who recently revealed that President Buhari was anemic has passed on to glory. 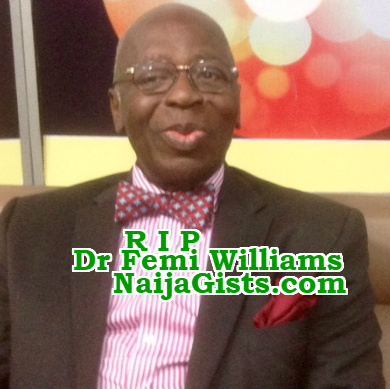 Dr Olufemi Williams lost his battle to an undisclosed ailment yesterday Sunday the 16th of July 2017 at the age of 76. 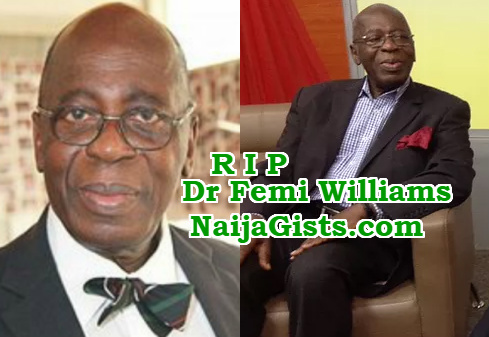 According to a family friend who confirmed his death last night, the eminent Professor of Medicine and the founder of Lagos-based Africa Cancer Research Center breathe his last breath around 4:55pm yesterday. The family source who was too distraught to speak at length promises to release more details on the demise of the icon today. The late icon was the professor of Pathology at UI and UCH Ibadan. In his lifetime, Dr Williams who was the foundation Dean and CMD of UNICAL College of Medicine worked as a visiting Professor to Universities of Vanderbilt, New Jersey, Howard, Minnesota and Hopkins Cleveland Clinic. He was also the Executive Secretary of African Union Science Technical Research Commission in Addis Ababa. He graduated from Trinity College, University of Dublin in 1961. He held top faculty positions in Pathology at Dublin University and later at UI. Dr Olufemi Williams authored 7 medical books and 100 medical journals. May his soul Rest In Peace and his good work continue, amen. A good, productive son of Nigeria. God grant his family fortitude to bear the loss. He’s indeed a great icon, goodnight. Prof Williams was a true icon who had passion for medical pathology. When he talked, everyone listened. He was a great father, friend and a good citizen of Nigeria. We will miss him. Up school, Up boys. I will forever miss you my dear prof. i am still speechless and in shock since after your death, so many plans were drawn and were to be carried out but God decided to take you away from us. keep on resting until we meet on the resurrection day.